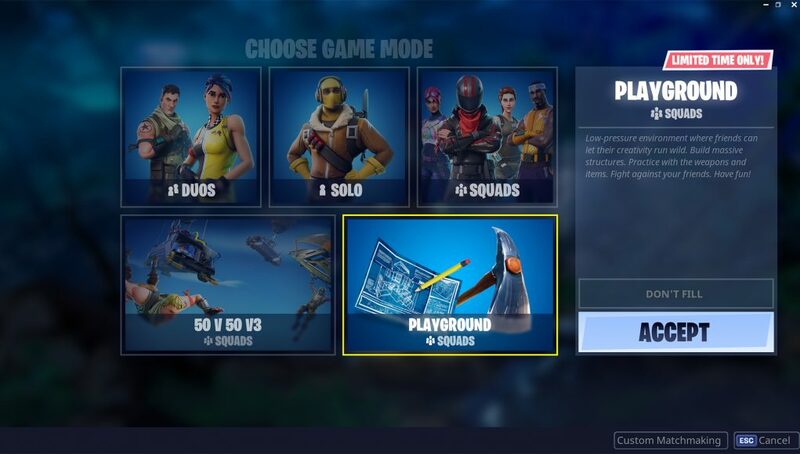 The Playground LTM has finally started to roll out worldwide! Check your available game modes and start practicing the new limited time mode. Epic Games announced the mode initially last week, but pulled the mode after several back-end matchmaking issues were discovered. Epic has been working over a week to address all of the issues and ensure that the matchmaking servers are stable enough to support the new Playground LTM while also not causing issues with the default modes in the game. More info on Playground can be viewed here. UPDATE: Epic has posted on Reddit stating that they are now slowly rolling out Playground LTM, and that it will be going live in different regions at different time. Epic says they plan to have the mode available to all players later tonight. We’ve completed our testing process for the improvements to our matchmaking services and are deploying servers that will bring back the Playground LTM. You may notice that some regions or platforms gain access to this LTM before others, this is intentional and allows us to gradually open this game mode up to ease stress on all relevant backend services. This process may take some time. But get those creative ideas ready, our aim is to have this fully available to all players later tonight. We’re going to closely monitor our stability over this time. We’ll provide another update once we have more information.